The first quarter of 2015 has come to a close and investors everywhere are reviewing their performance. This is the perfect time to evaluate the effectiveness of your investment strategies and to make adjustments accordingly. 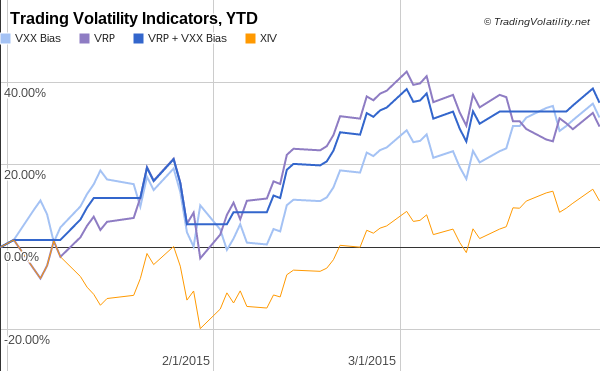 Our VXX Bias and VRP indicators have both navigated the first quarter quite well, at +31% and +29% YTD, respectively. These two indicators each provide end-of-day signals for placing swing trades in XIV and VXX (if you're not already familiar with our trading strategies you can learn more about them here). Our preferred strategy, VRP + VXX Bias, combines the two signals to place trades only when they agree on direction and is +35% YTD. The graph below tracks the daily values for each of our indicators as well as XIV (buy-and-hold) as a comparison reference point (the usual investment benchmark, the S&P 500, is not included because it is an irrelevant +0.9% YTD). If you're not quite meeting your investment objectives this year perhaps we can help. For less than $3 per day we provide subscribers access to all of our VIX data & metrics, our indicators, automated Bias change alerts, and the members' forum. --> New in 2015, we will be providing an additional level of visibility into our trading by having our performance verified by a third party (Marketfy). We recently tweeted our YTD portfolio performance of +17.8%, which was obtained by using the VRP+VXX Bias strategy as our guide. Look for additional updates on real-time notifications of our trades in the future.